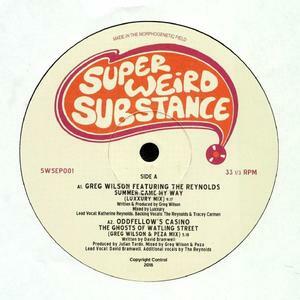 As the title suggests, Super Weird Select Volume 1 gathers together some of the most sought-after cuts on Greg Wilson's growing Super Weird Substance label. First up is Luxxury's deliciously languid, poolside nu-disco take on Wilson's own "Summer Came My Way", featuring the attractive and cheery vocals of regular collaborators The Reynolds. Wilson and Peza's rework of "The Ghosts of Watling Street" by Oddfellow's Casino is a gently acid-flecked nu-disco shuffler, while the Henry Extended Mix of The Superb Weird Society's "Gone With The Vibe" is a p-funk flavoured electrofunk workout. Arguably best of all, though, is the classic disco soulfulness of Wilson and Peza's closing remix of The Reynolds' Bessie Banks cover, "Don't You Worry Baby The Best Is Yet To Come".